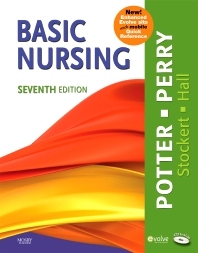 Basic Nursing is known for its direct, easy-to-read style and visually appealing design, making it perfect for busy nursing students. It covers all essential nursing principles, concepts, and skills and consistently follows the 5-step nursing process framework. With a strong focus on critical thinking, lead authors Patricia A. Potter and Anne Griffin Perry provide an excellent foundation for clinicals. The 5-step nursing process provides you with a constant framework for all the clinical chapters. Unique! Improved readability makes it easy to understand key concepts. Care Plans demonstrate the application of the 5-step nursing process to individual patient problems. Companion CD helps you learn and apply textbook content with tutorials, audio glossaries, and video clips highlighting different skills. Audio chapter summaries allow for easy content review, even on the go. English/Spanish audio glossary provides definitions and explanations of key terms. Unique! Video icons direct you to videos of skills on the Evolve website for additional practice. Each skill includes unexpected outcomes and related interventions to alert you to what might go wrong and how to react. Key terms reinforce key points in the text and familiarize you with the language of nursing and health care. Unique! Synthesis in Practice boxes tie case studies to appropriate theory, helping you gain insight into the how? and why? of nursing care. Unique! Evaluation boxes provide you with a follow-up to case studies and help you relate the situation to actual practice. Best Practice boxes relate how research can be applied to everyday practice. Patient Teaching boxes instruct you how to best teach a patient about self-care. Care of the Older Adult boxes highlight changes that occur with aging and how they affect delivery of nursing care. Cultural Focus boxes alert you to care issues unique to people of specific cultural backgrounds. Delegation coverage teaches you to delegate appropriately for comprehensive, safe patient care. Key points summarize the most important information and act as a quick refresher tool. Review questions prepare you for the NCLEX® examination. Critical thinking exercises relate real scenarios to those you will encounter in clinicals and practice.